A 9-year-old castrated male Labrador presented for evaluation of a dark mass inside the left eye. The owners noticed the mass recently. 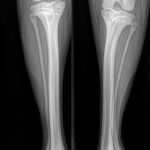 The dog had showed no sign of discomfort nor visual deficits and he was otherwise healthy. Multiple distinct dark brown, smooth spherical structures were visible in the ventral aspect of the anterior chamber of the left eye (Figure 1). No other ocular abnormalities were noted. Differential diagnoses for an intraocular structure of this type include neoplasia or uveal cysts. Hyphema would appear red rather than brown and is unlikely to form well-delineated spheres. Foreign material is unlikely in a comfortable, non-inflamed eye. 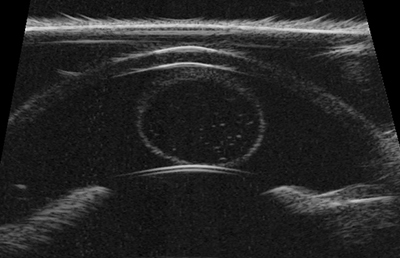 Next diagnostic steps involve evaluating the intraocular structures for mobility and transparency. If the spherical structures move with head and eye motion, uveal cysts are much more likely than neoplasia. If the structures are transparent, as these are, then they are also much more likely to be uveal cysts than neoplasia (Figure 2; the arrow indicates a region where transparency can be noted). Transparency can be demonstrated by illuminating the structures with a strong light source placed at an oblique angle to the eye. In cases where cysts are heavily pigmented and do not transilluminate well, ultrasound may be used to differentiate cystic lesions from solid masses. This requires use of a high-frequency ultrasound probe (35 MHz or similar) with copious amounts of sterile ultrasound gel or another standoff device. In Figure 3, the pairs of bright curved lines at the top and bottom of the image represent the cornea and anterior lens capsule, while the circular hyperechoic structure with anechoic center in the center of the image represents the fluid-filled cyst. Solid masses, by contrast, would appear diffusely hyperechoic on ultrasound. 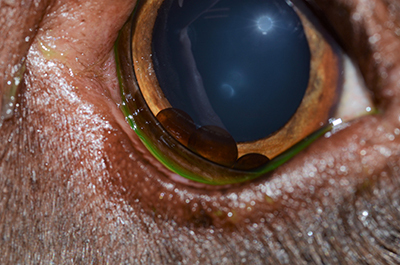 The pigmented intraocular structures in this dog are uveal cysts. No treatment is necessary at this point in time. Uveal cysts are usually benign incidental findings in dogs, with a few exceptions. 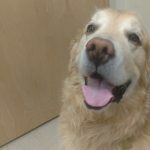 In certain breeds – Golden Retrievers, Great Danes, American Bulldogs – cysts are associated with other ocular diseases, such as Golden Retrievers uveitis or glaucoma. 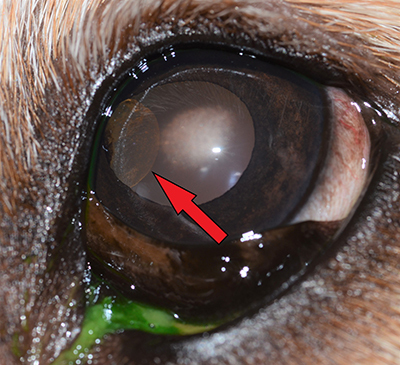 Documentation of cysts in these breeds should prompt intraocular pressure measurement and referral to an ophthalmologist. In rare individuals, too, large numbers of uveal cysts can fill the anterior chamber, interfering with vision. 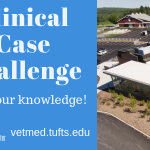 In these dogs, a veterinary ophthalmologist can ablate the cysts with a diode laser or remove them from the eye using the irrigation/aspiration function on a phacoemulsification (cataract surgery) unit. The latter approach may be preferable as the deflated cysts are removed from the eye so that they do not obstruct the iridocorneal angle or trabecular meshwork. 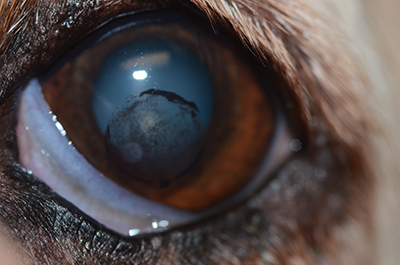 Uveal cysts are relatively common in dogs and are usually not cause for concern. Uveal cysts generally form spontaneously but have also been associated with trauma and intraocular inflammation. Uveal cysts may be found floating in the anterior chamber as in the dog described here, adherent to the pupillary margin or posterior iris (Figure 4), or ruptured on the corneal endothelium (Figure 5). Degree of cyst pigmentation varies significantly between individuals. Uveal cysts may be differentiated from solid masses by their mobility and transparency, or by using high-frequency ultrasound. 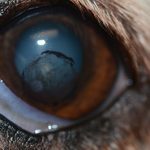 Golden Retrievers, Great Danes, and American Bulldogs with cysts should be referred to an ophthalmologist, as should dogs with multiple cysts interfering with vision.